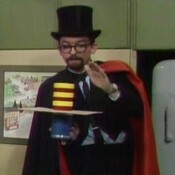 Mr. Appel is a teacher and magician friend of Mister Rogers. In thanks for sharing his talents, Mister Rogers once gave Mr. Appel a red apple: "An apple for an Appel." Mr. Appel once performed at Betty's Little Theater and invited Mister Rogers to the rehearsal. In the Neighborhood of Make-Believe, Mr. Appel was struggling to make ends meet and began selling his magician's equipment in order to pay for food and clothing for his family. With the help of his many friends throughout Make-Believe, Mr. Appel became the first artist to benefit from King Friday's newest foundation -- The King Friday Queen Sara Saturday Royal Foundation for the Performing Arts (KFQSSRFFTPA). 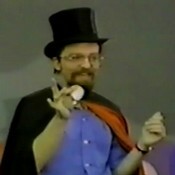 Through the KFQSSRFFTPA, Mr. Appel was able to continue working as a magician.